Athens: This report is from a recent conversation with a woman migrant who was detained in Petrou Ralli prison for 3 months. She talks about the terrible situation in Petrou Ralli prison. In fact she did not want to use the word ‘prison’ for Petrou Ralli, rather she calls it ‘hell’. Originally published by Athens Indymedia. Photo (above) credit: Katja Lihtenvalner. I am a woman migrant who was in Petrou Ralli prison for 3 months. The information I am sharing here was conveyed to me, while I was also a prisoner, by the wife of a migrant man prisoner who was raped by the cops. In mid November 2018, a group of prisoners, migrants, started a hunger strike to protest about the situation in Petrou Ralli. For almost 4 days they didn’t eat anything, but when they realized that the cops did not pay any attention, they stopped the hunger strike. After a few days the same prisoner protesters started another hunger strike, against the terrible and very little food that they get in this prison. 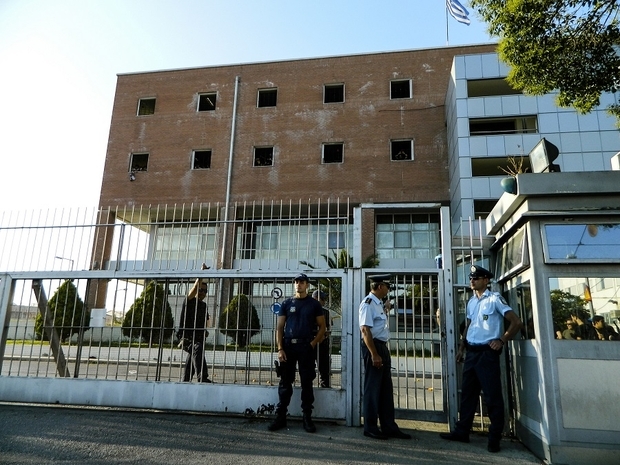 Around 20th of November, in the Alpha 3 segment of Petrou Ralli prison, which is where the men prisoners are, a cop was beaten up in protest against the brutal situation in this prison. After this event, the cops took all the prisoners, one by one, out of the building, where they severely beat them.For the two prisoners who were accused of having beaten the cop, the cops forced both prisoners to take off all their clothes, and then raped them with their batons. Now I am no longer in the Petrou Ralli hell, yes it really is a hell. While I was in Petrou Ralli, I thought there is a nice life out of prison, waiting for me. But now I see the reality, which I was wrong about; I am homeless and alone in another hell.